With millions of new posts being created every hour, it’s difficult for businesses to create Facebook content that gets noticed and engaged with by readers. It’s not uncommon for marketers to try to use tricks to boost their engagement, but this is something Facebook has always fought against. In their latest algorithm change, Facebook will start to penalize pages that use “engagement bait” tactics to increase likes and shares. Engagement bait can take many forms, but the most common form is a simple “Like this post if you like [x]”. “X” can be anything that’s popular with the target audience, whether it’s jelly beans, Jedi, or Jesus. Some people who like [x] will always like a post worded in such a way, and that will artificially boost the reach of the post. 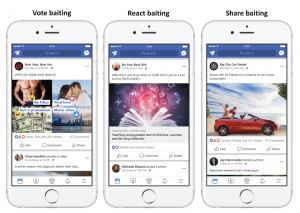 Facebook has take action against the most common forms of engagement bait in the past, but they’re expanding to cover different forms of engagement baiting. For example, vote baiting and reaction baiting are now included. Furthermore, the punishments will become more strict, included page-level demotion for chronic engagement baiters, not just demoting the individual post. Facebook has several good potential reasons to crack down on engagement bait and to discourage its use. First, engagement bait encourages people to like or share poor-quality content. This could be bad for Facebook. If the algorithm shows people the posts that get likes in their news feeds, and they’re posts that say “Share this post if you like Fridays”, the quality of the Facebook experience will decline. More importantly to Facebook, engagement bait screws up the entire basis of their advertising system. Facebook assumes that people like and share the content that means the most to them. They use that information to determine advertising profiles. So anything that gets people to click on things they really don’t care about throws a monkey wrench into the system. The renewed fight against engagement bait may also have to with Facebook’s larger fight against the use of their platform for misinformation. Engagement bait tactics were often used to promote links with misleading information. By using phrasing such as “Share this article to stop [x]” where “x” was a politically charged topic, content creators were able to get people to share or like content they hadn’t read or was of questionable accuracy. Whatever the reason, the algorithm change means that Facebook marketers need to make sure their pages aren’t using engagement bait tactics. This isn’t a new policy, per se, so pages shouldn’t have been using engagement bait in the first place, but the new page-level demotion make it more important than ever to never use them. Remember, if nothing else, engagement bait is insulting to your audience. They know how liking and sharing content work. There’s no reason for you to tell them when to do it. And it’s insulting to assume that your audience is so simple that will click on anything that has certain phrasing. It’s like chain letter wording, it’ll work on some people which is why they keep spreading, but most people see it as annoying rubbish. 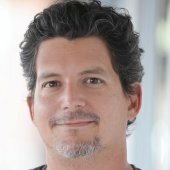 For more recent news about online marketing, read this article about changes to Google ads.